The ultimate experience in Door County Wineries. 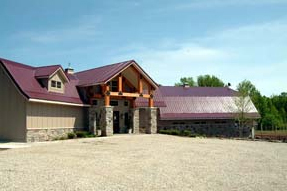 The countys largest vineyard and most modern winery. Featuring free wine tasting and tours. Guided winery tours feature a complete review of the winemaking process from harvest through bottling and casing. The tour ends at our extremely popular and ever expanding retail shop. Open May 15-October 31 10am-6pm daily. November 1-May 14 11am-4pm.